Caring Educated Teachers: Dermer’s Creative Care Preschools believes kind and nurturing teachers are foundational in developing your child’s natural curiosity and propensity for learning. Our teachers are specialist in child development, many continuing their education to provide a wonderful and unique learning experience. Devoted to developing a love for learning in children all ages, our educators are dedicated to maximizing individual child performance. Safe Environment: For the safety of your children our staff is certified in emergency preparedness including CPR for toddlers, children and adults. Our facilities, school toys and supplies are continually cleaned and disinfected to promote a healthy environment. Constantly under loving and careful supervision, children in our classes get all the monitoring and guidance they need to thrive. Scheduled Projects and Activities: A day at Dermers includes educational projects such as dramatic play with an emphasis on reading readiness, math and science concepts. Organized activities include art, cooking and sensory learning. Physical education opportunities include music, movement and outdoor play. Curriculum: Teachers personalize educational experiences based on monthly themes targeted to their specific classroom and subgroups. Our children enjoy age appropriate activities engaging each child and their entire class to be creative while discovering a love for learning. Contemporary Playgrounds: Dermer’s Creative Care Preschools have spared no expense in providing outdoor facilities that are as safe as they are exciting. Park like playground equipment allow children to enjoy and learn through physical play and exercise while developing social skills that can last a lifetime. Special Events: Dermer’s specializes in special events. Children will enjoy many holiday parties and parties honoring family, special visitors that share their knowledge, field trips, Pre-K graduation ceremonies, Bar-B-Q and water play days. Extra curricular activities including computer, karate and dance classes. Nutritious Meals: Morning and afternoon snacks supplement a nourishing lunch, all crucial to our student’s enjoyment and maximizing their academic performance throughout the day. Parent Communication: We encourage communication between parents, children and teachers through an open door policy in regards to visits and inquiries. Daily documentation of care, behavior and educational progress keep parents apprised of their child’s learning environment. Involvement Opportunities: Special events such as field trips and parties, special educational days and holiday programs provide ample opportunities for continual parental involvement. Making Memories: Dermer’s believes your child’s formative years should be as memorable as possible. Our teachers enjoy providing their students and parents with personalized books filled with monthly photos, quotes, and samples of art and concept experiences. Pre-kindergarten classes receive our “All About Me” book written and illustrated by each child filled with classroom lessons and homework collected every two weeks. Many of our young students enjoy the feeling of being grown up as they do homework with their older siblings. Dermer’s Creative Care Preschools also provide a personalized year in review DVD featuring pictures of projects and videos throughout the year. 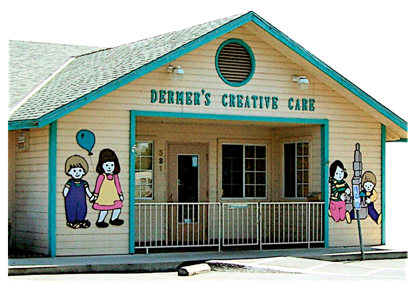 Dermers Creative Care Preschool also provides a personalized DVD “Pre Kindergarten Year” featuring special events, educational presentation parties, field trips, and cooking activists. Best of all you have a virtual memory of children having fun in a happy healthy, safe learning environment.